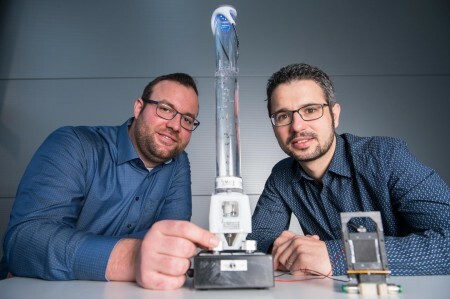 A research team from Saarland University in Germany has developed self-regulating valves and motorless pumps made from electroactive silicone film, which offer enhanced functionality in industrial applications. Led by Professor Stefan Seelecke, the researchers are able to control the responsiveness of the valve by sending electrical pulses to the film, as well as being able to monitor its position and shape. Flow rate can be continuously varied through these electroactive valves and pump performance can be regulated. The devices are also able to indicate if they have become blocked and can be shaped to fit almost any casing, according to the researchers. The silicone film is printed on both sides with an electrically conducting material, known as a dielectric elastomer. This works through the application of a voltage to the film, which “generates an electrostatic attractive force that compresses the film, causing it to expand out sideways,” according to team member and PhD engineer Steffen Hau. By controlling the application of the electric field, the researchers are able to impose ‘high-frequency vibrations or continuously variable flexing motions’ on the silicone film, allowing it to adopt any position or orientation. This movement is controlled through intelligent algorithms, which will enable the researchers to develop self-regulating valves and motorless pumps. The thin silicone film is cost-effective to produce and the components are all lightweight. The researchers claim that a film-based valve uses up to 400 times less energy than a conventional solenoid valve.